Appalachian Voices is committed to seeing investments made in solar energy in the seven counties of Southwest Virginia that has historically been the coal-producing region of the state. Our goal is to help establish a renewable energy sector that builds community wealth and gives the region a competitive advantage in attracting new business interests. In its 2015 strategic plan for Virginia, the Appalachian Regional Commission called for “accelerating the development and use of renewable energy sources” and promoting “green and renewable energy options.” This enthusiasm for renewable energy has been echoed by local planners, elected officials and many other leaders in the region. 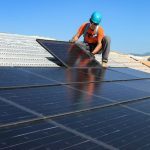 Solar power in particular is one of the hottest job markets in the country, and holds tremendous potential to reinvigorate Southwest Virginia’s slumping economy. Solar employment now accounts for the largest share of workers in the U.S. power generation field, surpassing coal, gas and oil, according to the U.S. Department of Energy. In 2016, the solar workforce increased by 25% over the previous year to 374,000 employees, compared to 187,117 electrical generation jobs in the coal, gas and oil industries combined. 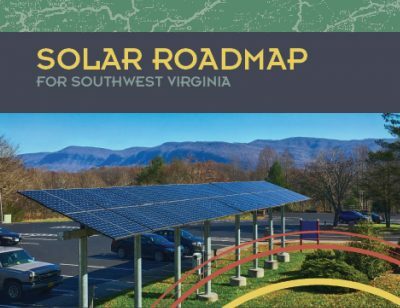 The Solar Workgroup released this “roadmap” in November 2017 to lay out the steps needed to grow a robust solar energy sector in Southwest Virginia. 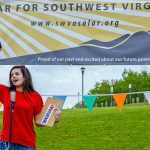 Appalachian Voices has partnered with University of Virginia-Wise and People Incorporated to co-convene a Solar Workgroup with numerous other nonprofit and public entities to develop a Roadmap for Solar Development in Southwest Virginia. The ultimate goal of this effort is to implement several solar projects in the next two to three years ranging from residential to large- scale commercial. other questions and research needs raised through the stakeholder process. 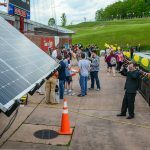 The group’s initial assessment of the solar industry potential found that capturing roughly 32.4% of the electricity demand in the region through local solar installations would create more than 650 career-length jobs — a major boon for Southwest Virginia communities and catalyst for establishing a renewable energy industry here. While the number of solar jobs drops after construction, the goal would be for Southwest Virginia to become the hub for the solar sector in the broader region to continue the manufacturing and services components. Moreover, the availability of abundant renewable energy would help attract the growing number of high-tech companies and manufacturers that have committed to meeting 100% of their energy needs through renewables, such as Google, Amazon and Apple. Install 80 kilowatts of rooftop solar at Norton Green, a 40-unit low-income housing complex for seniors in Norton. These projects could yield between $240,000 and $535,000 in energy savings over a 25-year period for low- to moderate-income residents as well as a rural school district facing declining revenues. These installations will serve as marquee projects for our larger goal of developing and implementing a renewable energy strategy and workforce development program for far Southwest Virginia. As the Solar Workgroup planning continues, Appalachian Voices is also expanding our grassroots outreach activities to educate local citizens and to ultimately increase participation in the group. We are reaching out to businesses, civic clubs, churches, schools and the general public, doing presentations and encouraging further citizen engagement.